← I Couldn’t See Any Benefit to It!!! For some reason there was about a square foot of sunshine on our living room carpet today. The rest of the floor was shaded. When I walked into the room, my cat had found the one sunny spot and was resting in it. My decision to take his picture prompted him to move. The best I could do to recreate the scene was to place him near the square of sunshine for the photo. In this photo he now appears to be deciding where to rest. Maybe this pose is more instructive to us anyway. What has to happen before we simply put our weight down in the only place of warmth and light our current story offers? Does it require contentment with what we have? Does it release responsibility for what we cannot change? Does it call me to be thankful for what I do have rather than expressing concern for what I do not have? Has the God who loves me chosen the best seat for me? I want to rest there today. 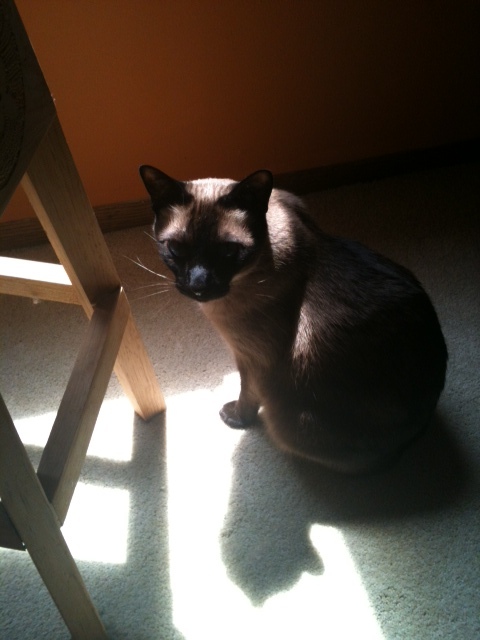 This entry was posted in Thoughts and Reflections and tagged cat, contentment, God, rest, sunshine, warmth. Bookmark the permalink.